To misquote Oscar Wilde, to exaggerate once is a misfortune, to do it twice looks like carelessness, but to do it repeatedly looks like unforgivable systemic unreliability by some of our major science organisations. Corals have a unique way of dealing with changing temperature by changing the microscopic plants that live inside them. These microscopic plants called zooxanthellae give the coral energy from the sun by photosynthesis in exchange for a comfortable home inside the coral. But when the water gets hot, these little plants become effectively poisonous to the coral and the coral throws out the plants turning the coral white – it bleaches. But most of the time the coral will recover from the bleaching. And here’s their trick- they take in new zooxanthellae, that floats around in the water quite naturally, and can select different species of zooxanthellae to be better suited to hot weather. Most other organisms have to change their genetic makeup to deal with temperature changes, something that can take many generations. 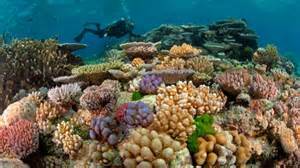 But corals can do it in a few weeks by just changing the plants that live inside them. They have learnt a thing or two in a couple of hundred years of evolution. The problem here is that the world has been completely mislead by scientists about the affect of bleaching and rarely mention the spectacular regrowth that occurs.